Moses said this to the people of Israel. But they wouldn’t listen to him because they were so discouraged, and their slavery was so cruel. At this point in this historical story, Moses has already confronted Pharaoh once and hard-hearted Pharaoh refuses and takes away giving straw to the people for their bricks. The quota is unchanged, the work doubled. The people now see God as making things worse. And how could they not? The battle for freedom is always the most intense when God begins to cut the chains. The resistance can cause bitter discouragement, physical exhaustion can dull the senses; this the enemy knows. Yet greater does God know our weaknesses and infirmities! We must be convinced that we can not do what God has set out to. It’s not to “get us out of the way” so much as to give us different eyes to see, ears to hear, and hearts to trust. God set out to free the people of Israel, He did not set out to get them to free themselves. So, He hardened Pharaoh’s heart, and kept moving forward in His plan and timing. No resistance would deter Him. Not in His people, not in Pharaoh, not in the ultimate battle with the real enemy of slavery. We keep our eyes on God because He is always where victory is. In sharing the Good News, we can often wonder how one can see the good of it when they are suffering so profusely! The ones who need it the most these days are so blinded by the outward circumstances. How can we make a difference? We notice the way God works throughout history. He says: “go, do and say all I tell you, and trust Me.” The resistance will come, discouragement will attempt to assassinate, the enemy will work hard to disillusion. Fear not! Read these powerful words as your mission! The Israelites proceed to watch God do wonder after wonder! Proceed to watch resistance after resistance. Proceed to watch their deliverance! It took time, it took the resistance, it took miracles, it took hardening, it took everyone by storm; but freedom was given – God did what He set out to do! He always has, always will. There is nothing by which I can give you here on earth as an example of the kind of guarantee one can have in God. He is the surest, surest thing! The ultimate insurance, best lawyer, His contracts (promises) are never revoked and always honored, His timing without fail or error every time, His goals reached infinitely! Resistance to our human eyes is a guarantee! But to the eyes being given by God, it is a sign that we should move more swiftly! It’s not futile to God, it’s the natural response from an enemy who won’t stop fighting Him. UNTIL…Yahweh’s time says, “Enough!! !” The time is rapidly approaching, the resistance is fierce! Futile against God, yes! But not futile in His hands! Everything He made has resistance as His signature. The ground (gravity) opposes the objects upon it. Thank God! Our very cells in our bodies oppose the bad elements that don’t belong! Praise the Father! Light opposes darkness! Great is the Light of the World! In order to see resistance as a wonder in the hands of a God who created it’s very nature, we must look at Him! The great Resistor of all evil! The Victor of all opposition! Ruler and Master, not one thing slips past Him. Resistance is sure, but more sure is I Am, who breaks the chains that bind us all! In order for chains to be broken, they must be placed between two opposing forces and pulled. SNAP! Thus, they are broken! Therefore, submit to God. 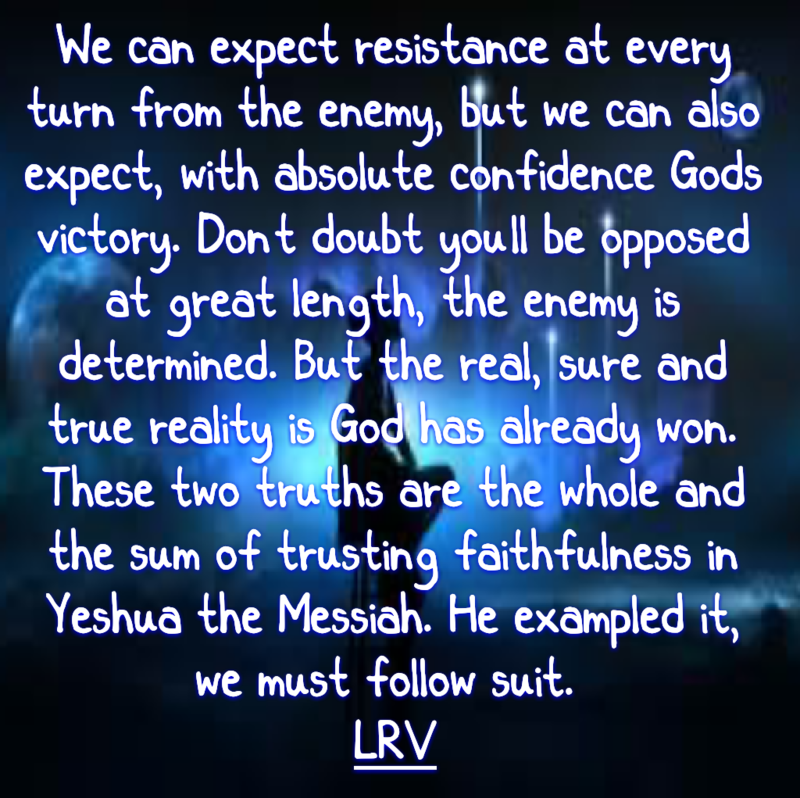 Moreover, take a stand against (resist, be stubbornly opposed to) the adversary, and he will flee from you. Come close to God, and He will come close to you. Clean your hands (resist the dirt), sinners; and purify (yield to the flames that resist and free to purify hearts of stain), you double minded people! Wail, mourn, sob! Let your laughter be turned into mourning and your joy to gloom! (Allow the resistance of your flesh to do its designed intent, not gratifying the flesh but making it wail to be forgotten). Humble yourselves before the Lord, (that Opposing Force destined for victory over the force of evil) and He will lift you up. Resistance is not futile, so long as we are resisting the right things. The resistance that comes upon us when we are resisting the world and evil, will not win. Our victory has been won by God alone, our resistance to evil is our worship and praise to the Victor! The opposition that comes from our obedience is a sign that God is fiercely moving us into His plan. It will tune our eyes and ears to Him more acutely. It will build the character of Yeshua (Jesus) inside the furnace of purity within us. And we shall see our freedom, here – now on earth as it is in Heaven! To God be the glory!